FEATURING THREE CHARACTERS FROM THE BESTSELLING BOOK-CLUB FAVORITE THE LIFE WE BURY, THIS NOVEL EXPLORES A RIVETING MURDER CASE TOLD FROM TWO OPPOSING PERSPECTIVES. Detective Max Rupert and attorney Boady Sanden’s friendship is being pushed to the breaking point. Max is convinced that Jennavieve Pruitt was killed by her husband, Ben. Boady is equally convinced that Ben, his client, is innocent. As the case unfolds, the two are forced to confront their own personal demons. Max is still struggling with the death of his wife four years earlier, and the Pruitt case stirs up old memories. Boady hasn’t taken on a defense case since the death of an innocent client, a man Boady believes he could have saved but didn’t. Now he is back in court, with student Lila Nash at his side, and he’s determined to redeem himself for having failed in the past. Vividly told from two opposing perspectives, the truth about the stunning death of Jennavieve Pruitt remains a mystery until the very end. Allen Eskens is the award-winning and USA Today–bestselling author of The Life We Bury, The Guise of Another, and The Heavens May Fall. A criminal-defense attorney for twenty-five years, he lives with his wife in Minnesota, where he is a member of the Twin Cities Sisters in Crime. 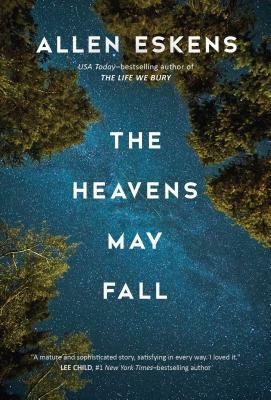 "The Heavens May Fall certainly adds to Allen Eskens’ growing reputation as one of the most talented writers in mystery fiction today." "Eskens's elegant but chilly prose, like winter in the blood, is well suited to this fiercely told morality tale (and its deeply cynical ending), which is sure to send all of us wretched sinners straight to hell." "Readers looking for a new voice should pay attention to Eskens." "Eskens has conjured up a marvelously black spirit of a novel. It's a taut, intelligent, heart-ripping story that explores the darkest places in the human psyche. After each unexpected twist, you'll tell yourself things can't get any worse. And then they do." "The talented Allen Eskens fulfills the rich promise of his Edgar®-nominated debut with this chilling, dark, and sinister thriller. With precision and authority, Eskens's determined cop hero takes one intriguing clue--and pursues it into spiraling disaster. With a deadly surprise around every corner and a bleak undercurrent of noir-like dread, this book will haunt you." "Another great, dark, and brooding page-turner from Allen Eskens, with a tragic protagonist who will break your heart. Eskens's characters will haunt you long after you finish reading."